This year taking place at Sywell 21st October 2018. Anyone know what is on the agenda? Website says AGM documentation to be added in due course. I have heard the rumours too and if they are true then a certain thread on here will have been closed prematurely and unpleasantness will overshadow the event. Hopefully, if the rumours are true, the LAA execs will see sense and kick the hinted at motion into the bin. Down my way the old jungle drums seem to be beating out a rather strange message too . Seems to be something like ; 'Raging forest fire now calm and under control , but unwise person now want throw petrol on'. Question: You go through a real bad spell , eventually though , there is light . A talk at a rally is pretty well received , that very same weekend , a forum thread that has hovered above like a guillotine blade is made safe. Now ,,,,what would your next move be . Surely it WOULDN'T be to remove the lock-pin from the guillotine blade would it ? Please will someone "in the know" decode this for the rest of us..... Thank you. Very frustrating, indeed, "we want to talk about something but we won't talk about it publicly, we don't even want to say what it is". If they cannot speak out - which may be justified - why begin about it at all, on a public forum? Now it sounds like either they want do distribute panic, or at least alarm, or they are hoping to get private messages. PS what's "AGM"? It is not in the glossary of my AIP. "All Gone Mad"? "Above Ground Minimally"? Last edited by Jan Olieslagers; 18th Sep 2018 at 19:02. Annual General Meeting; most organisations that are either charitable, or group owned in the UK are legally required to have one. It's nothing to do with aviation, as a concept. I presume they are talking about the possibility of an attempt at the LAA Annual General Meeting to re-instate the LAA award rescinded from T C-T a couple of years back. I was at her talk at the rally and, had I not known what I know from the PPRuNe thread, I might have been impressed. She is a very engaging speaker! However, although she never said the word solo at any point, and mentioned the contribution of her back-up crew on several occasions, I did note that she never mentioned that another pilot was in the biplane at any point. Only in the case of the Winslow crash, did she mention that another member of the crew was up front but she said that she was flying. She put the cause of this crash down to loss of power due to contaminated fuel. Last edited by Forfoxake; 30th Sep 2018 at 12:16. I really hope the 'membership' do not get hung up on this, and stick to matters that are important to the LAA and their continued good work in promoting homebuilding and operating elderly machines. A TV hyped situation should not even be allowed to come under discussion as it has nothing to do with the association or its reason to exist. TV endorsed side shows are a waste of space and should not be given the time of day. The LAA as was the PFA before is an amazing operation that we should be proud of; it has superb tech expertise, plus inspires, and encourages all comers to get involved in such a way that is world class. Only in the case of the Wimslow crash, .... She put the cause of this crash down to loss of power due to contaminated fuel. So that lie is perpetuated. Not what the NTSB concluded as far as I recall and I am sure the fuellers at Winslow will be interested to hear they are still getting the blame. @pobjoy, yes, this should never have come up to LAA in the first place and certainly should not be allowed to detract from the work they do. So @Forfoxake guessed right? Why now admit it implicitly, instead of stating so explicitly from the beginning? Because I for one didn't want this thread to turn into a part 2 of the other one. Hopefully that will reopen soon and this one can go on to discussing LAA AGM topics. Last edited by Planemike; 22nd Sep 2018 at 17:45. If this matter is allowed to proceed to AGM level , then the LAA is doing a dis-service to its membership . This topic was concluded in 2016 via the correct channels and has since been considered as 'case closed'. The LAA is a wonderful organisation. It allows ordinary people to build , operate and maintain their own aeroplanes . As well as being part of some great network of knowledge and experience , plus the opportunity to partake in as many fantastic Summer events as you can shake a stick at . This person has already hi-jacked a previous AGM , an AGM in which those attending had the privilege to be addressed by some extremely interesting and fine , worthy people . The LAA is about its membership ! And not the ego of one rather self-centred person . I am very disappointed they are revisiting this farce. I may be minded to cease membership in protest if they even waste AGM time debating this, never mind if they reinstate the award. The PFA/LAA has a long history of advancing aviation and should be embarrassed at getting tangled up in this. 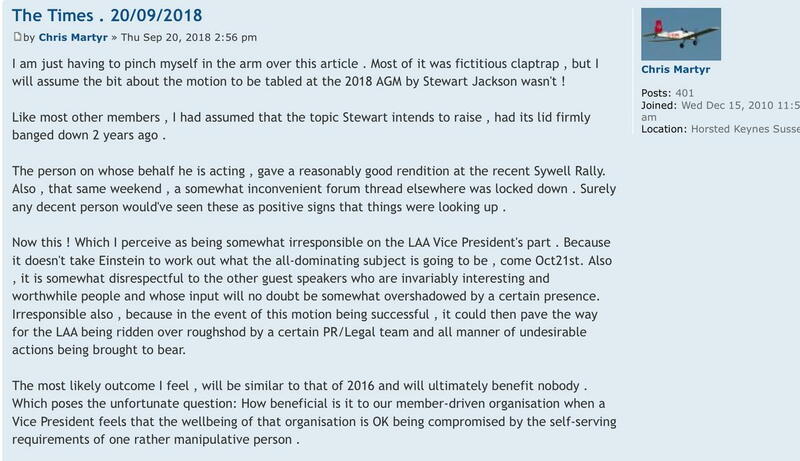 It certainly looks like being an entertaining event.I see Chris Martyr has posted on the LAA forum. As I have reopened the original thread regarding Ms. Curtis-Taylor, I will invite discussion on that topic to reside there. I don't want to truncate discussion about the AGM, of other topics warrant that discussion, however, I'd prefer to close this thread if it has no separate purpose. Does anyone wish to have this thread kept open for AGM discussion on "other" topics of the LAA? As we have not yet received formal notice of the AGM, nor its agenda (promised with the October edition of the magazine), I think it only fair that this thread does remain open until the topics listed for discussion are announced to the membership.....unless The Times tomorrow has more news about the LAA AGM! I would prefer this thread remained open. I have refused to read the T C-T thread for some months now on principle. As stated earlier by myself and others the PFA/LAA should stick to matters pertaining to building and flying of recreational aircraft. Please may we have some form of statement from the LAA.